Battery Asking » Cleaning » Best Pressure Washer Brands (Reviews 2019) – Can I add bleach in my pressure washer to enhance washing? By appearance, all pressure washers might seem to operate the same. But, until you start using one and that is when you realize there is a big difference between each pressure washer and more so the pressure washer brands. It is always safe to invest in popular brands and those that you are familiar with rather than venturing on a new brand you have never heard before. You wouldn’t want to be an experiment of a brand that you hardly have known about unless it is on a free offer. It is therefore for this reason that we have carefully listed the top brands for the best pressure washers in the market. That way, you have the information and the best ideas in selecting a pressure washer from one of these brands. Keep right here to find out the best pressure washer brands you can trust with your hard-earned cash when looking for the best performing pressure washer. Q: Can I add bleach in my pressure washer to enhance washing? Q: How long can I extend my pressure washer hose and still maintain the pressure? Q: Can a clogged nozzle damage my pressure washer? Which brand did you like best? “GO WITH JOE” is the slogan the Snow Joe + Sun Joe, a company started in 2004 has. More than a decade now and the manufacturer has become popular in manufacturing the best pressure washers in the market. Moreover, the company gives the best warranty of up to two years which is an assurance of what they offer. Here are two of their best pressure washers and the best in the market. SPX3001 is an electric pressure washer that has a motor power of 14.5amp/1800 watt to generate water pressure of up to 2030 PSI with a water flow rate of 1.76 GPM. It comes with five quick-to-connect spray nozzles – 0, 15, 25, 40, and soap for maximum cleaning effect to handle light, medium, and heavy-duty cleaning chores. Beyond that, it has a microsensor (TSS – Total Stop System) to sense the water flow in the pump which switches off the motor once there is no water flow. Once the trigger stops operating, the engine immediately shuts off to protect the pump from overheating and therefore prolong its life span. SPX3001 operates with dual soap tanks with each having the capacity of 0.9L and which are removable to allow refilling and washing in case of switching the detergents. These are some of the qualities that have made it a CSA approved. The pressure washer can handle water with temperature up to 104 degrees Centigrade. It, therefore, prompts the effective cleaning of any grime formed by either grease or mud. However, the connector between the machine and the hose won’t seal properly after a few handling since the plastic connector loses groove quickly. But, you can solve the problem by replacing it with a brass connector. SPX4000 is another great pressure washer from Sun Joe that has proven to be successful in cleaning services. It is sturdy with a 14.5 amp/1899-watt motor that generates a water flow of 1.76 GPM and water pressure of 2030 PSI enough to perform maximum cleaning. The best thing about this pressure washer is that you can choose to switch the PSI water pressure to your desire for your different tasks. You can either select low pressure of 1450 PSI for the usual dirt and everyday washing or choose high PSI which is 2030 PSI to clean tough and resistant dirt. With five quick-to-connect nozzle tips 0, 15, 25, 40, and soap, no dirt can stand up to this pressure washer. Whether it is low, medium, high or heavy-duty, your cleaning task will appear so simple and easy. With easy-to-glide wheels, you can maneuver your pressure washer as you wish. However, it has a long 20-foot hose which you can use far enough without gliding your pressure washer. Also, it features a power cord and an onboard soap dispensing tank. One thing you should note is that replacing the adaptor is pretty hard. If anything happens and you need to replace it, you have to search carefully to get one that fits the hose. The hose is larger than most of the adaptors in the market. If you are looking for a gas operated pressure washer, then Simpson is the brand you should consider. They are the best in heavy-duty gas powered pressure washers. Until recently in 1985 they started using power tools for manufacturing their units. Before then, each pressure washer was hundred percent handmade without using any tool. After the demand exceeded the supply and the workers got overwhelmed, it was then they introduced to power tools in their manufacturing. One of the best pressure washers from Simpson in the market is SIMPSON Cleaning PS3228 which is powered by Honda engine GX200. Simpson PS3228 is powered by Honda engine GX200 which will alert you when the oil is low to keep on providing powerful cleaning for years with less maintenance. The triplex plunger pump with PowerBoost technology enables high pressure and consistent water flow. With five quick-to-connect nozzle tips numbering 0, 15, 25, 40 and the soap one with an ergonomic spray handgun, the pressure washer, therefore, is a multi-task tackling rigorous cleaning tasks effectively. The pressure washer can be used on both domestic and for commercial. A wielded Steel frame which houses the motor and the pump assures you of durability. For smooth movement, it has pneumatic wheels. You might not need to move your pressure washer much since it has a lengthy 5/16 inches of 25 feet flexible hose which is non-kink because of its threaded fittings. Simpson PS3228 pressure washer comes with warranties of 5 years for the pump, three years for the Honda motor engine, ten years for the frame and for the accessories it has 90 days. One thing you might not like about this pressure washer is that it is so powerful it rattles when working. Other than that, it is one of the best pressure washers. Stanley Black & Decker is a manufacturer of electric and gas pressure washers. Stanley family members started the company. Fredrick and Henry Stanley were the force behind this manufacturing business. The company started as a manufacturer for doors’ hardware from the year 1843. After significant changes and improvement in manufacturing, Stanley began buying competing companies and merging them into their company. It is in one of these mergers that Black & Decker was enjoined to Stanley to become what it is now. Currently, Stanley Black & Decker is one of the biggest and the best manufacturers of pressure washers. One such successful pressure washer is Stanley SHP2150. For multi-tasking, it features four quick-to-connect nozzles with numbers 0, 15, 25, 40 including a spray gun on a zinc/steel lance. It also includes foam cannon for deep cleaning with foam to remove greasy dirt and grime which you must rinse afterward. The 22-mm brass connector tightly attaches both the garden hose and the pressure washer to prevent any leakage or to detach when moving the pressure washer. It also comes with a 25-foot high pressure soft and flexible hose and 35-foot electric cord with GFCI auto-reset plug. One drawback with this pressure washer is the soft, flexible hose which forms kink and therefore interferes with the water pressure. Apart from that, the machine provides powerful and excellent cleaning. Briggs & Stratton is famous for manufacturing gasoline engines which are mostly used on pressure washers, lawnmowers, generators among many. The manufacturing company which was founded in 1908 by Stephen Briggs and Fredrick Stratton has grown significant and influential in the manufacturing industry of all types of engines. Therefore, the company has over 100 years of expertise in durable power cleaning equipment, and other fields globally. One of its products is Briggs & Stratton 020681 electric pressure washer. By buying Briggs & Stratton 020681 electric pressure washer you are assured of the exact said 2000 PSI and 1.2 GPM water flow rate from satisfactory verification by an independent lab. Therefore, winning any dirt and grime on all surfaces, and other pressure washable areas is not a guess work but real with an assurance. The pressure washer has a robust welded-steel frame with a pass in military-grade drop test for durability. It also has a neat foldaway design for better storage. The brushless induction motor runs quietly enabling you to use the washer in the quietest and peaceful environment. It operates with four quick-to-connect nozzles for multi-purpose cleanings such as washing cars, driveway, walkway, patio, deck, walls, and many others. Cleaning with Briggs & Stratton will cut your washing time up to 40 percent while using the timer saver turbo nozzle. You can also include a favorite detergent in the half-gallon in-built tank for excellent cleaning results. Briggs & Stratton 020681 is lightweight but not a light-duty pressure washer but can handle many heavy-duty tasks. Generac is an American company that was founded in 1959 and started manufacturing portable generators. Over time and after various changes Generac Holding Inc. moved with ‘leaps and bounds’ to become a global leader in the manufacturing industry. It has a wide range of commercial and residential use power products which includes pressure washers. One of its best pressure washers is model 6922 – 2,800 PSI. Find out its details here below. Generac 6922 is what you would want to have if you are considering having a gas-powered pressure washer. It features quick-to-connect nozzle tips 0, 25, 40, and soap for multi-purpose cleaning. The ergonomic design cushion grip of the spray gun provides a comfortable hold as long as the washing lasts. The spray trigger is made for easy-to-pull with minimal effort reducing fatigue. Generac 6922 is a compact unit but with maximum and reliable power to give you excellent cleaning experience. You don’t have to fret about assembling the unit. It is a ‘walk-over’ and effortless affair that is user-friendly. The OHV shaft engine horizontal positions the pump at the level of the engine high enough above the ground making it easy to fix the hose. What you might find lacking in this pressure washer is the nozzle to wash cars. The tips that come with it may not be suitable for car washing. Nevertheless, the pressure washer is great to use on other surfaces. Today, WEN which locates in the USA in Elgin, Illinois has expanded to add other various power products which include pressure power washers. Read on to find out more of one of their pressure washers as detailed below. No amount of dirt and grime can withstand the cleaning power of WEN 3100 PSI and 2.5 GPM water flow. The combination of the water pressure with its flow rate will restore the shining surface to its original newness. Since it is gas-powered, you should be worry-free from the limitations of the power cord in venturing far and wide to enter into the murkiest surface and leaving it spotlessly clean. Working with WEN pressure washer is less effort and much fun to watch clean surfaces unraveling before your eyes. 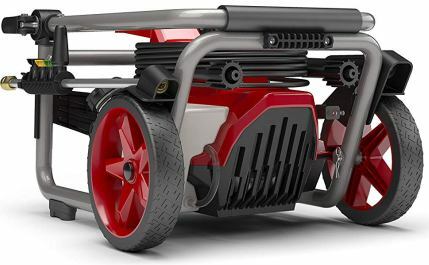 It features a 30-foot high-pressure hose that connects easily to the pressure washer. The 42-inch spray lance has a lockable trigger and an easy to fix five quick-to-connect nozzles. You wouldn’t have to wonder where to keep the nozzle tips. It has in-built nozzle storage that is easy to reach whenever you need to change nozzles. The pressure washer is a 208cc OHV power engine with an axial cam pump for high pressure and exceptional performance. However, as much as an axial cam pump can perform faster, it also wears down more quickly. With WEN pressure washer, you have what you deserve, the BEST. No, you should not use bleach. No matter how mild the bleach might be, it can damage some parts in the pressure washer and especially o-rings and seals in the wand, gun, hose, and pump. The pressure performance starts to decrease after a 100-ft length of the pressure hose. The shorter the pressure hose, the better performance it will have. If your pressure washer has wheels, then you should consider moving it instead of extending the pressure hose. Yes, any machine behaves like a human being who can’t hold too much pressure. A clogged nozzle likewise will increase pressure in the pump and thus damage the pump. Flush the nozzle with high-pressure water on the opposite side while unclogging it with a wire. Remember to disconnect the wand from its gun before you beginning the nozzle cleaning process. It has been a pleasure walking with you through the best pressure washer brands. We hope by now you can identify the best brand to visit when purchasing your pressure washer. It is always safe to stick to the top brands of any pressure washer whether gas powered or electric powered. Whether it is a high PSI or a low one, at least you know the experts in all these and know which to go select. Do not hesitate to click on the pressure washer that you feel suits your cleaning requirements and complete your purchase immediately. Please post your comments on the section reserved for you here below.